You don’t have to look any further for your dream home! This stunning, meticulously kept home is located on a lake lot in The Bluffs on the waterway, a Gated Intracoastal Waterway Community in Myrtle Beach. Whether you have a big family or just like to have extra space, this home is perfect for you! No expense was spared in building this amazing 4 bedroom, 3 full bathrooms, and 1 partial bathroom home. At 3,400 square feet, you’ll have all the space you could ever need. 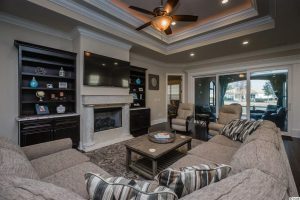 This unique home is full of charming features, such as the amazing master suite, a gigantic master bath, spray foam insulation, and the pull-down screen for the garage. This home also has security cameras along with extra landscaping to give it that final touch of beauty. Don’t wait any longer to give us a call today! Schedule a tour of your future home or take a look at the virtual tour option available for this property.